Parallels Toolbox is a set of must-have utilities to help you get things done faster on your Mac. 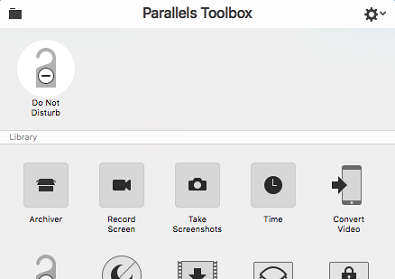 Easily take screenshots, record on-screen video, transfer media to iOS devices, archive and password-protect files, grab a video from the web, or record audio — Parallels Toolbox contains one-click tools to accomplish these, and many other tasks easily and quickly. Visit KB 123903 to see the list of available tools. Parallels Toolbox is included as complimentary software with Parallels Desktop for Mac. You can also buy it as a stand-alone product. Note: You need to have a subscription for Parallels Desktop or Parallels Toolbox to receive new tools and features when they are available. To install Parallels Toolbox after installing Parallels Desktop for Mac, follow the steps in KB 123925. To install a stand-alone copy of Parallels Toolbox, follow the instructions in KB 123931. 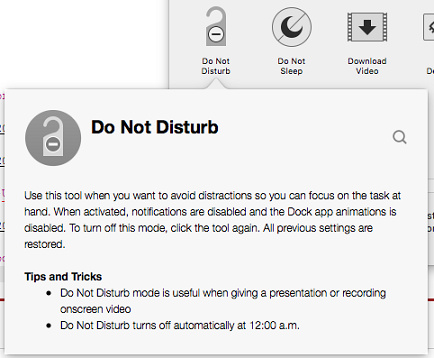 To enable a tool, simply click on its icon. For more details on Parallels Toolbox features visit the pages below, or refer to the Parallels Toolbox User's Guide.